In this episode, massive explosions, Janyuu shows flashes of goddamn action hero and Takato screams a lot. There's even a monkey! 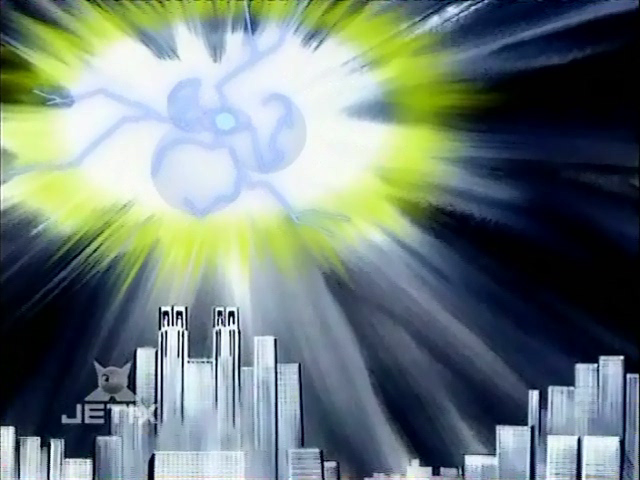 Three months later, this episode aired in the United States, probably because it had to. It's crucial to the plot and sets up the entire second half of the series. It survived mostly intact, losing a single exterior explosion shot. But can you imagine what would have happened had the Japanese premiere been one week later? Delays for sure... possibly even an overhaul of the entire episode. It's frightening to think how close we may have been to never seeing this in its original state. It's a good thing we did, because it takes everything we've seen in the first 22 episodes and wraps it all up in an epic conclusion to the first act. Hypnos has another bout of competency as a superpowered Juggernaut program drains all the Digimon, including the good guys. Yamaki's completely lost it, madly happy about the program reaching full power and the painful effect it is having on the Digimon. Janyuu walks off in disgust, judo chopping a few hostile guards on his way out for good measure. It's hard to explain why the guards didn't want him to leave, but Janyuu was impressive and Hiroaki Ishida would be proud. Then Makuramon happened. He's certainly a bold fellow. 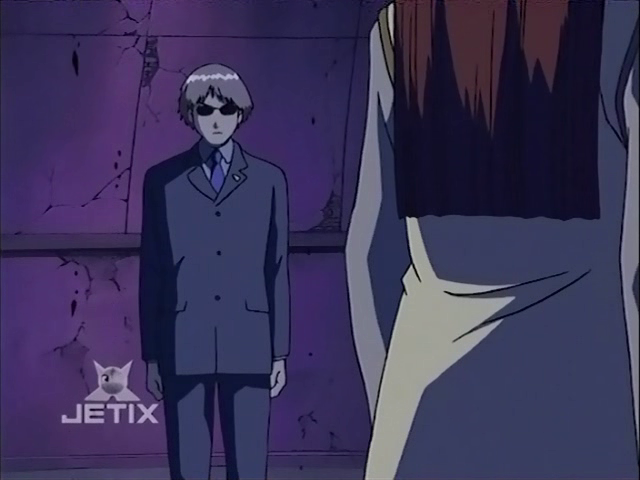 First he spends a few episodes spying on the kids in plain sight, trying to determine the source of evolution. Then he reveals himself and asks for Calumon. He doesn't attempt to bargain with Jeri, Kazu and Kenta. He doesn't promise to call back Vikaralamon (which probably would have worked). He doesn't even say please. He just says “fork it over,” even seeming irritated later when they refused and he had to just steal the little bugger. His voice is manic and a little unhinged, making his declaration of war against humanity pretty damn unsettling. It puts Yamaki in an “oh crap” mode for the second half the episode, aided by Makuramon throwing a wrench into the Juggernaut program. The resulting implosion fries everything and sends the staff fleeing. While Tally can't get out fast enough, Riley stares at Yamaki in pity before he shoos her away so he can watch his creation explode around him in peace. Juggernaut's demise frees Vikaralamon and his foes for the final battle. Normally, there wouldn't be much to say when Takato's primal screaming proves to be the difference between WarGrowlmon's victory and defeat. But it's so soaked in irony. 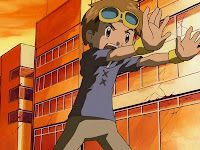 With WarGrowlmon trapped under a fusion ball, the city in ruins and the situation looking bleak, Takato finally succumbs and admits that he's overwhelmed by the intensity of being a tamer. He just wanted to play with Guilmon, and hates seeing Guilmon's evolved forms become more and more monstrous. While Henry and Rika talk him off the ledge, he shakes off Janyuu's call for evacuation and turns the tide by screaming. A lot. For all of Takato's fears about losing Guilmon, ultimately Takato has to tap into a sense of pure animalistic fury in order to give WarGrowlmon enough power to win. Who's losing a piece of themselves now? It's simultaneously ridiculous and a stark picture of how the tamers must sacrifice a bit of their souls for the job. Welcome aboard, Jeri! 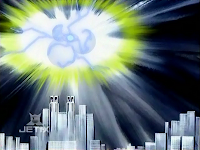 In the end, however, the city is torn to shreds and Calumon is in the hands of the Devas, meaning more destruction is in store if the tamers sit back and watch. Facing the threat of open war between the worlds (ask the Data Squad gang how that turns out), Takato makes the declaration... they're going in. Big and nasty as Vikaralamon is, they also did a nice job giving him an appropriately disgusting voice. You cringe looking at him, hearing him, and presumably smelling him. If it wasn't bad enough watching the tamers getting their butts kicked and all the insanity at Hypnos, now even Calumon's flipping the hell out, instinctively fearing for his life even before Makuramon reveals himself. And then they even add Impmon dealing with an interloper of his own. The plots thicken all at once. It was nice to see Takato's parents dealing with the evacuation, looking for their son and stumbling upon the hideout and the discarded bakery bags within, but where's the resolution to that? The other great thing about the "Takato screaming" scene is how it develops the connection between him and Guilmon from episode 14. There, Takato felt what Guilmon felt in battle and received a psychic message from him. Here, it's Guilmon who feels what Takato feels and receives the psychic messages on how to battle, with Takato acting out the fight before Guilmon does rather than Guilmon's pain transmitting to Takato. It's a great way to frame the arc and showcase the theme of connection between tamer and Digimon. "It's frightening to think how close we may have been to never seeing this in its original state." Oh my gosh, this is quite possibly the best commentary I have ever read about the impact of 9/11. How frightening a thought, indeed.